Imagine celebrating your spouse’s birthday on a sunny afternoon. You are dining in one of the fine restaurants of France. Your table is on a shaded terrace alongside a medieval canal. Half-timbered houses line the canal and flowers hang everywhere. 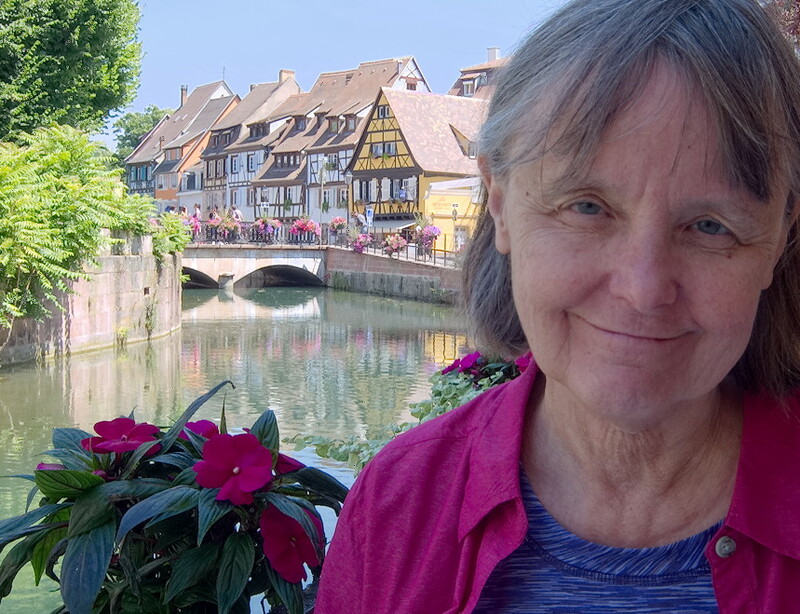 This is JY’s in Colmar, and here is how I saw it. Now imagine you want to capture the scene in a snapshot. You are carrying a simple point-and-shoot in your shirt pocket, so you whip it out. Voila! The blue sky you see turns white and the green foliage goes black in the shade. This second picture is typical of pocket-sized cameras, and it shows their primary limitation. To take a picture is to spray photons of light at an image sensor. Where only a few land, the sensor records mostly its own electronic noise. More photons mean brighter tones, but pocket-sized cameras have image sensors that are too small to handle many photons without being overloaded. This greatly constrains the dynamic range — the range of brightness between pure black and pure white — that a little camera can capture. I never would have expected that any little camera could produce the photo with the blue sky above. But a little camera did, a $400 Fujifilm XQ1 that I pulled out of my shirt pocket during lunch. A Porsche Under the Hood — The XQ1 is a point-and-shoot camera that looks like any other and can be used as simply as any other, but it has a high performance engine under the hood: a small version of Fuji’s X-Trans sensor. (For a description of the X-Trans sensor, see “The Lazy Man’s New Camera: the Fujifilm X-E2,” 19 March 2014.) Unlike most point-and-shoots, the XQ1 can save raw files for later processing as well as produce JPEGs. On top of that it offers the controls of a professional camera and — quite a feat of design — manages to make them accessible and reasonably convenient to use. The XQ1 seemed interesting enough that while I was packing for a month of backpacking through Europe, I decided to take one with me instead of a heavier “real” camera. I found it surprisingly capable. Even at ISO 800 the camera has some spare dynamic range. For example, here on the left is the camera’s normal JPEG; on the right is its raw image with detail pulled out of the blacks. This looks sharp and clean as an 11-by- 14-inch print (28cm by 36cm). To my astonishment, I even found ISO 3200 to be a useful film speed on the XQ1, although at this sensitivity its sensor is so noisy that the raw image has no dynamic range to spare. 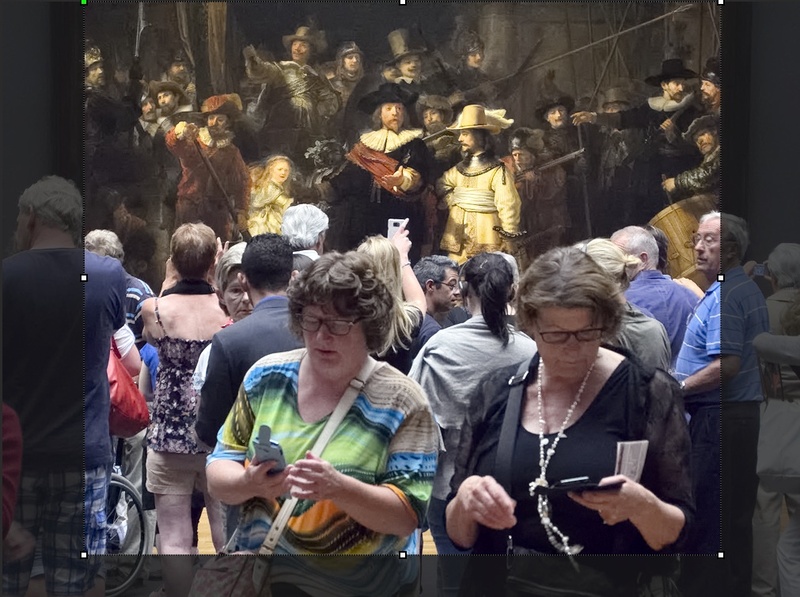 I printed this droll picture of Rembrandt’s “Night Watch” trimmed as you see here on 11-by-17-inch paper (~A3). The result is not the cleanest enlargement I have ever made, but it meets the standards of professional photojournalism. 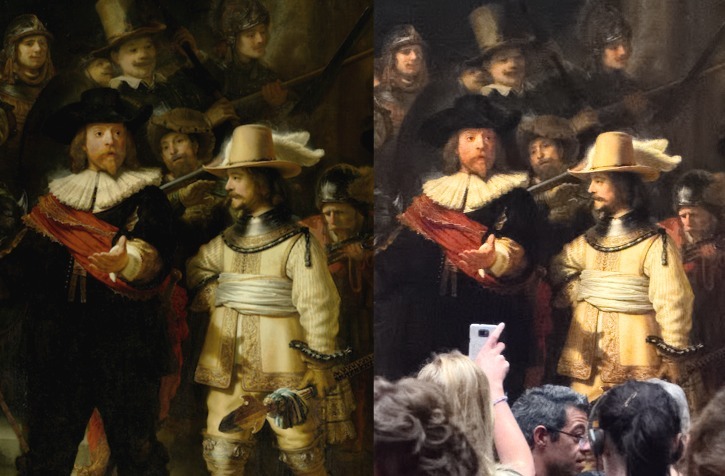 In the image below, you can compare a detail from my photo to a reference photo supplied by the Rijksmuseum, a small part of a carefully controlled image containing 163 megapixels. 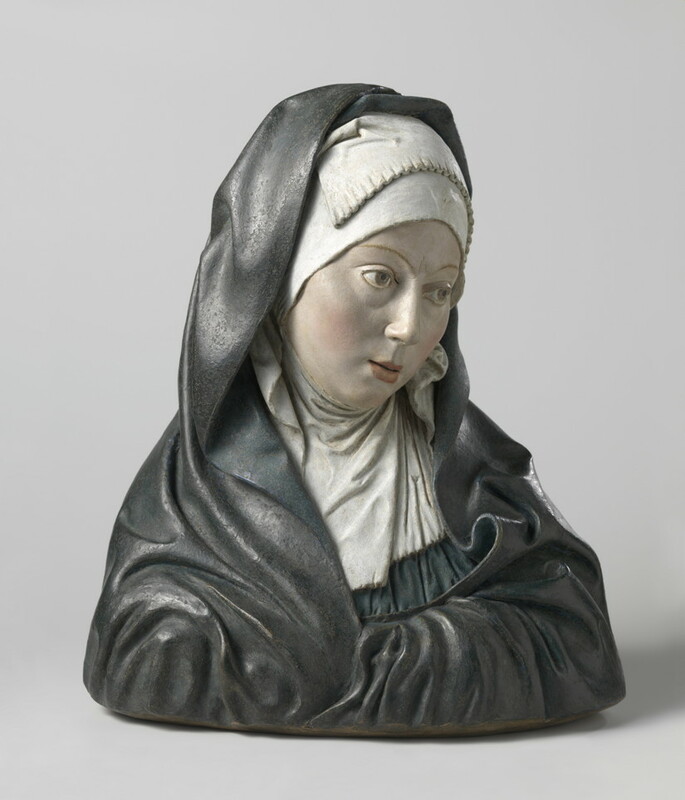 The Rijksmuseum’s photo is of course sharper and can be enlarged many times larger without breaking up, while mine is close to its maximum enlargement. Even at ISO 3200, the dynamic range of the XQ1 is serviceable for most purposes. Sharpness and Detail — Most people assume that a professional camera must record exceptionally fine detail, but this is not true. An image spread across two pages of a glossy magazine can contain at most 4 megapixels of information. Professional photographs do not require super-fine detail, they require clarity. They require lines and middling details to be sharp and contrasty. To my eye, 11-by-17-inch prints from the XQ1 at lower ISO speeds compare to optical enlargements of a similar size made from 35mm film. In addition, the XQ1 can take good pictures at high ISO speeds that are beyond the capability of film. But of course, 35mm film has never defined the quality of photographic prints, and when examined closely, the XQ1’s images cannot compare to those taken with a professional digicam. 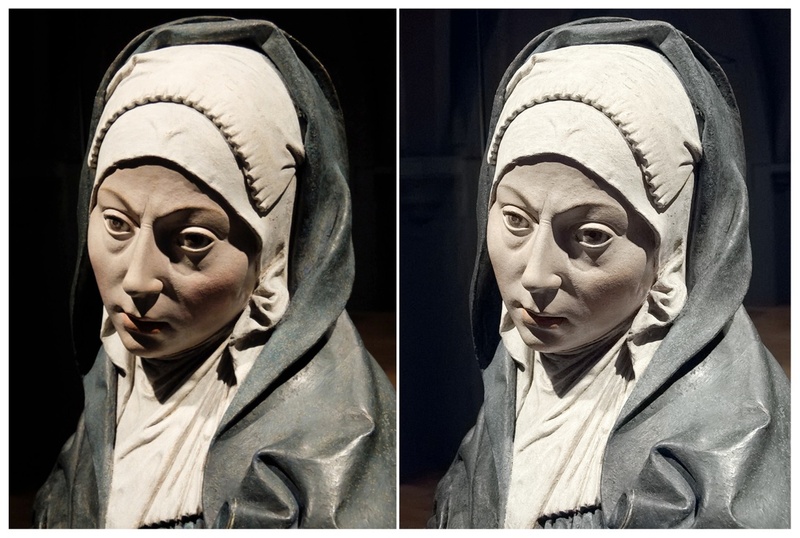 In the images below, the details on the left come from the XQ1 and, on the right, from Fuji’s 55–200mm lens on an X-E2. The top comes from the centre of each frame, the bottom from the edge. Both lenses are stopped down to the sharpest aperture. The image is a lossless PNG at 100 percent magnification. This is not what you might expect from Fuji’s marketing materials, but as skillful as they may be, Fuji’s copywriters cannot rewrite the laws of optics. An ideal lens casts an image of a point of light that looks like a point, but every real-world lens casts an image of a point that looks like a blurry disc. This blurry disc is large enough to spread beyond one cell on the image sensor to the surrounding cells. To minimize this blur with smaller cameras and lenses requires tighter tolerances in manufacturing, and one source of blur (diffraction) increases exponentially as the size of the lens is reduced. Software can compensate for some blur, but the XQ1 is very small and it costs only $400. You cannot expect miracles from it. Using the XQ1 — I have tried other point-and-shoot cameras that offered manual control, but none has been sufficiently straightforward to use. The XQ1 is an exception. I find it a little awkward to adjust, but not so awkward as to be a problem. Moreover, although it lacks a viewfinder, the screen on the back is visible under all lighting conditions. The screen dims automatically in low light, and pressing a button jacks up its brightness enough to be comfortable in direct sun. The primary difficulties I have using the XQ1 lie in framing the image. The lens’s zooming is motorized and impossible to control precisely, so I cannot crop as well in the camera as I like, and I end up trimming pictures more than my norm. Also, while looking at an LCD display on the back of the camera I find it difficult to keep vertical and horizontal lines perfectly straight, so I need to correct them more often than usual in the computer. Although using the XQ1 is nothing like using a professional camera, I did find myself using it to perform professional tricks, like showing motion. This I found possible using three of the four basic techniques. The “Night Watch” above uses stop-action. 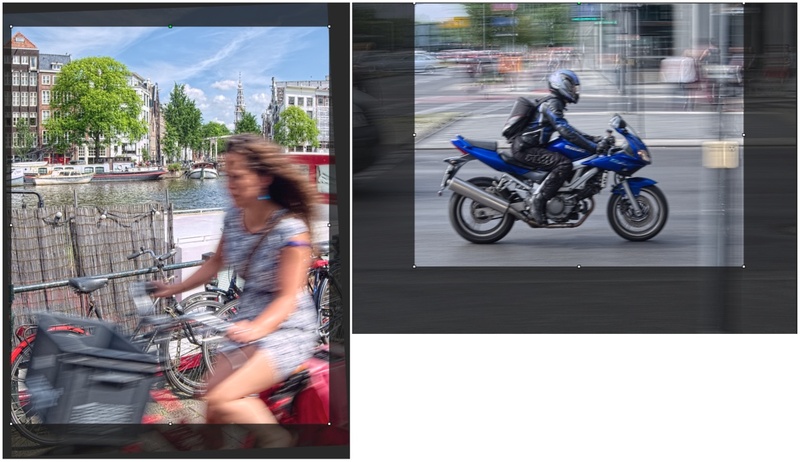 Below on the left, the street scene in Amsterdam shows a blurred subject, and the motorcycle shot on the right shows panning the camera to blur the background. You can see the full frames here as well as my crops. This right-hand picture looks good, but it is most peculiar. If you look closely, you can see that the people and objects in the background show a sweep of motion and then end up sharp. It looks as though the anti-shake kicked in toward the end of the 1/30 second exposure. The camera’s anti-shake correction is remarkable under normal conditions — I can usually shoot down to a shutter speed of 1/8 second — but there is no way to switch it off. 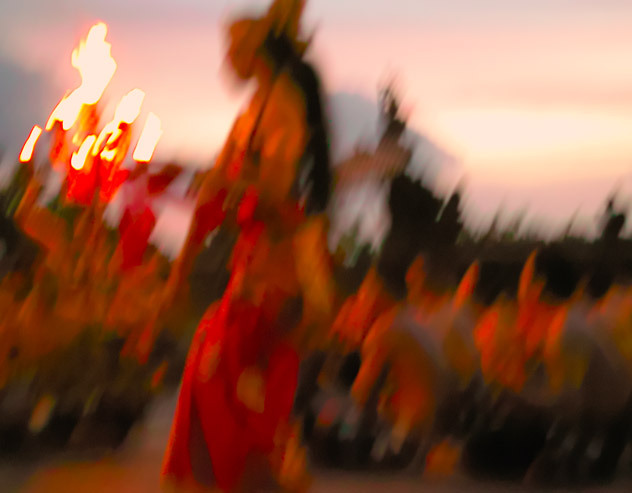 For this reason I have not tried using the XQ1 to show motion by blurring everything, as I did with a different camera for this Balinese monkey dance. JPEG vs. Raw — Like all digital cameras, the XQ1 will produce JPEG images automatically. To the extent that automatic JPEGs can be good, the XQ1’s JPEGs are good, but to my mind a good automatic JPEG is an oxymoron. An automatic JPEG is a one-size-fits-all shoe. Although they differ at the margins, all cameras compress the brightness of images in similar ways, based on curves worked out in the first half of the 20th century largely by Kodak. Kodak’s goal was to minimize complaints after people came back from the drugstore with a dozen postcard-sized prints that had cost them half a day’s wages. But minimizing complaints does not create excellence. Photographic excellence requires matching a scene’s dynamic range to the compression curve of the imaging process. Professionals can control the compression of black-and-white films to a modest extent, and Kodak eventually came to offer a small choice of colour films with different compression curves, but perfectly matching a scene’s lighting to film usually requires lighting the scene artificially, even when taking pictures out-of-doors. For example, I had to create this sunrise. Control of tonality is easier with digital cameras like the XQ1 that can capture a decent dynamic range and save raw files. Now, instead of travelling with flash units and reflectors, I use whatever lighting I find and adjust the picture to suit later. For example, here is a stunning stone sculpture by Frédéric Bartholdi, the Frenchman responsible for the Statue of Liberty that graces New York’s harbour. The XQ1’s JPEG on the left is too flat to show the strength of the carving and the chiselling of the stone. The directionality of the lighting is good — in the studio I might have used a similar setup — but its range of tones does not complement the camera’s compression algorithm well enough to result in a full range of tones from black to white. My version does. The automatic JPEG above — indeed, all of the automatic JPEGs in this article — is based on the XQ1’s default settings. Like all other digital cameras, the XQ1 includes controls that will override its defaults so that you can tailor the automatic processing for a particular subject, but I find these to be totally impractical. I cannot know how I want to process a picture until I see it, and I need to be able to redo the processing when I get the settings wrong. It’s easier and more certain to save raw images in the camera and then process them on the computer. Photo Ninja — To process the XQ1’s raw images, I do not use the version of Silkypix that comes with the camera, because I find it awkward and incomprehensible. Instead, I use the $129 Photo Ninja from PictureCode. 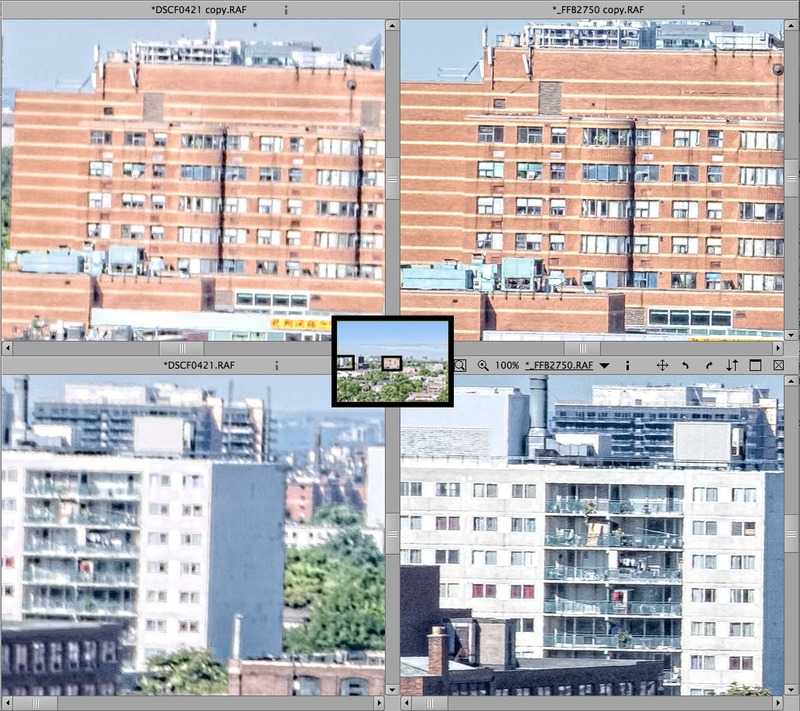 As you can see in the samples below, Photo Ninja brings out more sharpness than Adobe’s Camera Raw (a free Photoshop plug-in that also processes raw files) and a broader dynamic range. Note that both crops show the extreme left-hand edge of the image. For some reason Camera Raw is trimming the picture. Photo Ninja is a vector-based editor that modifies the entire image rather than individual bits. Thus, Photo Ninja can bring out the blue of a sky and the contrast of a scene but cannot remove a spot of dust or a stick sprouting from a woman’s head. Photo Ninja is also more limited in its vector transformations than Photoshop and some of Photoshop’s plug-ins. For this reason, pictures from my larger cameras I start in Photo Ninja but finish in Photoshop. However, my larger cameras have interchangeable lenses, which allow dust to fall on the sensor, and they have a greater dynamic range, which can support more extreme transformations. The XQ1 is dustless (at least so far) and has a more limited dynamic range. For it Photo Ninja is sufficient and is almost ideal. My only complaints about Photo Ninja lie with the user interface and a bug. Photo Ninja has a straightforward interface that is not difficult to learn, but since it’s a cross-platform application, some elements of the user interface do not look or function quite as a Mac user expects. The bug lies with an automatic feature. Photo Ninja’s presets provide good starting points, and if you calibrate presets to different cameras and lenses, then Photo Ninja chooses the appropriate preset automatically based on the EXIF information in the file. However, if a zoom lens is built into the camera — if it is not an interchangeable lens — then Photo Ninja won’t save a calibration for more than one focal length. The developer knows about this problem and expects to fix it in the next release, but in the meantime I need to straighten the XQ1’s barrel distortion for each picture individually. To see how Photo Ninja works, I suggest looking through its tutorials. Viewing Mode — Like all digital cameras, the XQ1 has two basic modes: shooting and viewing. The controls for shooting pictures are well thought out, but the viewing mode offers one “feature” that is peculiarly annoying. This feature is direct access from a button to a Wi-Fi function. When I push the button, the XQ1 sets up an ad hoc Wi-Fi network. I am then supposed to be able to reset my smartphone or tablet to use that network instead of my normal network, and to be permitted the use of a special Fuji app. This app is intended to display Fuji JPEGs on a tablet or smartphone — only Fuji JPEGs. No other JPEGs, no raw files, no desktop Mac, no normal network. This wouldn’t be convenient or useful even if it worked but, as it is, I cannot make it function on either of my iOS devices. Not only is this feature useless, it gets in the way. In shooting mode, the Wi-Fi button does double duty as the function button. Since I use the function button frequently, I often find myself pushing it by accident to access a shooting function while I am still in viewing mode. Once I do this, the camera sets up its Wi-Fi network and stops dead while waiting for a connection. To start shooting again I need to realize what I did, then press the back button or the shutter and wait four or five seconds. I also found an annoying bug, which I shall describe here in the blithe hope that somebody from Fuji will read this and see it fixed. I normally display data and the histogram along with a small version of the picture, but in this display mode I cannot enlarge the picture so that it fills the display completely and no more. The lever controlling the magnification goes directly from the thumbnail version to a cropped version, without stopping at a full-frame size. In Conclusion — The XQ1 is not so easy to use manually as a professional camera, but its manual controls are practicable, its LCD display is visible even in bright sun, and its automatic controls and effective anti-shake make it suitable for rank novices. Moreover, it can produce professional-quality images under many circumstances. Teamed up with Photo Ninja it bears a similar relationship to larger digicams as 35mm cameras bear to medium format and 4-by-5-inch film. The main functional limitation of the XQ1 is its lens, which is a zoom lens that’s equivalent to 25mm to 100mm with a 35mm system. The shorter end of this range covers a goodly wide angle but the longer end is too short for sports or wildlife, or to produce gee-whiz effects like a close-up of someone amidst a crowd or a distant landscape compressed in depth. On the other hand, the XQ1 is not a camera intended to do everything, it’s a camera intended for beginners or for a serious photographer who wants a pistol in his pocket when he leaves his big gun at home. That is how I use the XQ1, and I am pleased to have it. I never expected to see a camera so small that can take pictures so well. Comments About Fujifilm XQ1: A Professional Point-and-Shoot? In all camera reviews, no one ever mentions how the manual mode actually operates. As an old style photographer, I just want to dial in the f-stop, speed, and focus myself as I did in my Pentax K-1000. You may want to take a look at the Pentax Q-7 that would give you all and more available on the Fuji XQ1. It is smaller, has all the bells and whistles, and can be shot in full manual, using several of the Pentax Q interchangeable lenses. With a rather expensive ($275) Pentax adaptor it can utilize most all Pentax full frame lenses, automatically. With less expensive available aftermarket adaptors I've used film and TV 'C' lenses, Pentax Auto 110 lenses, and many more manufacturer's lenses as well. I have to say, this is the most useful review I have read of any camera ever. In this one review you mentioned dynamic range and the importance of tonalities, how sensor sizes determine the final image, clarity, how perspective and light change our perception, shooting techniques, post processing software and more. This is the first article I read on your website, and I am very impressed and very thankful. I will be reading your other articles too. Glad you liked it! Charles has written quite a few pieces on cameras and photography for us over the years, many of which are still relevant. I'm reading his previous articles as we speak. Mr Mauer, please write more for tidbits. Mr Engst, please allow Mr Mauer to write more frequently! He is a knowledgable teacher, and those two don't go hand in hand in photography, sadly: there is a lot of giving information, versus giving knowledge (giving man fish versus teaching man how to fish). A lot of how's, very little why's. I realize this is a computer software site; could you find a way to have more articles on photography? We have Charles write for us as often as possible. His camera reviews are second to none. Given the upcoming demise of Aperture / iPhoto, might this be a good moment for Charles to assess the field and the alternatives?